A rare reunion between two historical powerhouses will be staged at next month’s Sugar Bowl. Texas and Georgia both rank among the NCAA’s all-time winningest programs. Only three of UT’s all-time wins, however, have been recorded against Georgia. The Bulldogs have 819 wins in their history, but the Longhorns have only once been their victim. The schools have scheduled a home-and-home series that will begin in 2028. Texas and Georgia first met in the Orange Bowl on Jan. 1, 1949, and the unranked Longhorns ended their 1948 season with an upset of the No. 8 Bulldogs. Georgia struck first on a 71-yard interception return in the first quarter, but UT eventually rallied to a 13-point lead. After Georgia made it a 28-27 game in the final frame, Texas put the game away behind Randall Clay’s two touchdown runs. Texas was led by senior Tom Landry’s 107 rushing yards. That was Landry’s only 100-yard performance as a Longhorn. After losing three of its previous four openers, UT began its 1957 season with a successful trip to Atlanta. Mike Dowdle was the standout at Grant Field as he rushed for 60 yards and two touchdowns on 13 carries. Walter Fondern and Bobby Lackey also rushed for scores. The 19-point conquest made a winner of Darrell Royal in his debut as UT’s football coach. Royal went onto win 167 games and three national titles with the Longhorns. Texas held a 7-0 lead at halftime of the 1958 rematch, but future Hall of Famer Fran Tarkenton threw for a touchdown and two-point conversion to give Georgia an 8-7 edge with 12:05 left. Texas, though, secured the game with a 17-play drive that Bobby Gurwitz capped with a one-yard run. On that game-winning possession in Austin, Texas tallied 72 of that game’s 159 yards of offense. Texas opened its 1958 season with five straight wins. The first four of those conquests, including a 15-14 win over No. 2 Oklahoma, came by five points or less. UT’s only blemish is this series is considerably more noteworthy than any of its triumphs. Texas entered the 1984 Cotton Bowl undefeated and ranked second nationally. 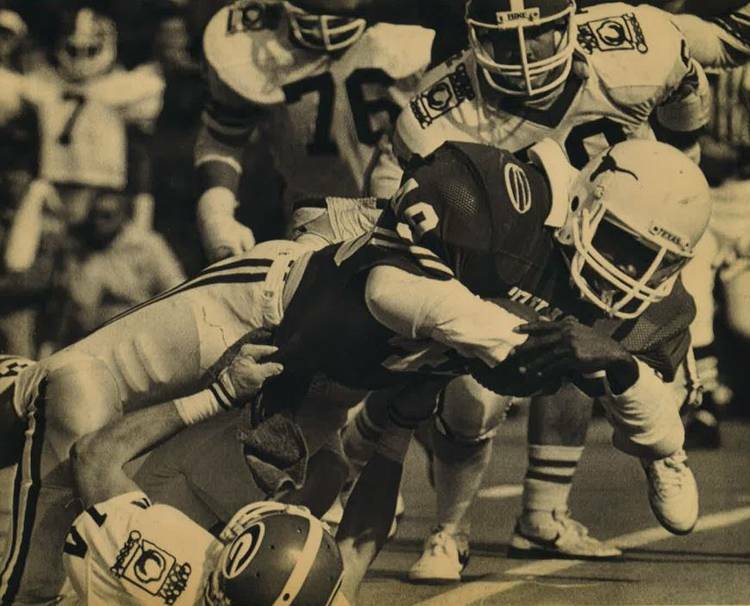 Top-ranked Nebraska was also beaten in its bowl game, so the one-point loss to Georgia likely cost UT the 1983 national championship. Georgia forced four turnovers in its close conquest. Set up by a muffed punt by Texas, Bulldog quarterback John Lastinger’s 17-yard touchdown run with 3:22 remaining was the difference. Jeff Ward led Texas with his three field goals. He also missed 40- and 43-yard attempts. Ronnie Robinson rushed for 88 yards in the loss.